These are the 9 things you need to know before you buy your inflatable hot tub. If you’re new to the world of inflatable hot tubs, about to buy your first ever hot tub, then this beginner’s guide will help you make the right decision. Our advice and tips will arm you with all the information you need so you don’t make an expensive mistake. First off, let us just clarify that inflatable hot tubs also go by other names. They are also known as inflatable spas, blow up hot tubs, portable jacuzzis, inflatable jacuzzis, portable hot tubs, and portable spas. So if you see an inflatable hot tub you like, but it’s called a portable jacuzzi, don’t let that put you off. It’s just a different name for the same thing! We mostly use the term inflatable hot tub on our site, but occasionally we’ll throw in some of the other names, just to help you know that they are all one and the same. At least in name! That’s because. . . When you decide to buy a new inflatable hot tub, the company who makes your hot tub really does matter. The world of inflatable hot tubs has taken off hugely in the past few years, and as the demand has grown, so has the number of companies manufacturing inflatable hot tubs. This has meant an overall improvement in the design, quality, and value of the hot tubs for the most part. However, it has also meant that a few companies have started producing inflatable hot tubs cheaply and quickly, just to cash in on the market. These hot tubs are, to be completely honest, inferior models and a waste of money. So even though you might see an inflatable hot tub for sale that costs less than a branded one, it could end up causing you a lot of headaches and regrets. Therefore, as a rule of thumb, when you’re looking for your new hot tub, go with the trusted brands. These are the companies that invest a lot of time and money in developing great inflatable spas that will last you for years. Remember that their reputation as a long-term business depends on customer satisfaction which comes from building trusted products. You might see there is a new company that has started to sell a few inflatable hot tubs on sites like Amazon.com and Walmart. This is the GoPlus company. They produce cheap-and-cheerful basic portable hot tubs. However, after some early glowing 5-star reviews, some owners are starting to find some issues with their purchases – while, to be fair, others are delighted with their hot tub. Our advice is that if you’re looking for a great, affordable inflatable hot tub, buy a model such as the Coleman Lay-Z Spa, the SaluSpa Miami or SaluSpa Paris. These have a long-standing reputation as great budget hot tubs, backed up by companies with years of experience and reliable customer service. Don’t be misled by the number of people it says on the box can fit into an inflatable hot tub. That’s because the number given refers to how many adults can sit in the hot tub, side by side, all close together. If you want your hot tub as a place to stretch out and enjoy a long hot massage, however, then the capacity is smaller than you’ll see advertised.. If you read any of our reviews, you’ll notice that we give the capacity for how many adults can lie back in the hot tub, with their legs stretched out. That’s because we feel this is how most hot tub owners use their hot tub, and we believe it’s much more useful to give what we think is the real capacity. 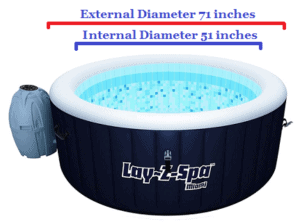 Please bear in mind these measurements are a general guide for round hot tubs. You’ll find there are an increasing number of different-shaped models, including square inflatable hot tubs such as the SaluSpa Hawaii, and even octagonal ones like the Spa-N-A-Box. These different-shaped models can be a little smaller than round hot tubs, as their shape provides more internal floor space, allowing hot tub users to stretch out more. Although the outer dimensions are important, it’s the inner dimensions of the hot tub you really need to consider. The walls of most inflatable hot tubs are between 8 and 10 inches thick. This means an inflatable hot tub that measures around 6½ feet across externally has an internal floor space which is a little under 5 feet. Bear in mind that the depth of the inflatable hot tub can also have an effect on how many people can comfortably use a hot tub. Generally, the deeper the hot tub, the slightly smaller floor space the hot tub can have. That’s because in a deep hot tub you don’t need to stretch out as far in order to have the water cover your shoulders. Inflatable hot tubs cost from around $300 up to top-of-the-range models that come in at well over $1,000. For your convenience, we divide the hot tubs we review into three categories: budget models which cost under $500, mid-range, and luxury for those hot tubs that cost over $1,000. Buying a cheap blow up hot tub doesn’t mean you are buying an inferior model, however. The budget models we review are all built to a very high standard with a good massage system, and they will last you for years, as long as you look after them. The mid-range and luxury models, on the other hand, tend to have more specialist features, such as internal seats, leather-style skins, more powerful massage systems, and more accessories. So if you want an inflatable hot tub to put up in your backyard for the summer, have fun in it with your family and friends, and then take it down and pack away come the Fall, then a budget hot tub will suit your needs perfectly. However, if you’re looking for your hot tub to be more permanent, more elegant-looking, even a feature of an indoor room or with its own outdoor enclosure, then you’d be better off with a mid-range or luxury model. As well as how much it costs to buy your inflatable hot tub, you need to think about how much it’s going to cost to run. There are three areas you need to think about: water costs, energy costs, and the cost of the chemicals you need to buy to keep your hot tub water clean and hygienic. 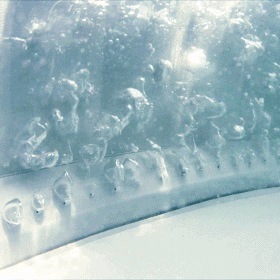 An inflatable hot tub holds a lot of water! Even the smallest model, the MSpa Elite Jet Reve holds 184 gallons, while the largest models hold almost 300 gallons. Therefore you need to think about how much it’s going to cost to fill your inflatable hot tub. You’ll occasionally need to drain your hot tub as well, to clean it, which means you’ll need to re-fill it. So take that extra cost into account as well. We have several articles and tips on ways of saving money with your inflatable hot tub. But one easy way to cut down on your water bill is to fill your inflatable hot tub only to the minimum-fill line, which you can see on the inside of your hot tub wall. Also, check with your water provider about your water tariffs and find out if they have a programme which allows you to fill your inflatable hot tub at a reduced cost. With your inflatable hot tub full of water, you then need to heat it to your desired water temperature, up to a maximum of 104F. This can take up to 24 hours, depending on how much water your hot tub holds. Once the water is heated, you then need to run the massage system when you want a massage, and run the motor unit to re-heat the water as it cools down. All of these take energy and cost money. You will also need to buy some chemicals to treat the water in your inflatable hot tub, to keep it clean and safe for your hot tub users. Using chemicals is a whole separate area of owning an inflatable hot tub, and understandably something that a lot of new owners worry about. However, we have a lot of easy-to-read articles which give you everything you need to know about using chemicals for different reasons. A good place to start is with our article Your Guide To Inflatable Hot Tub Chemicals (opens in a new tab). Buying the chemicals you need involves a small outlay and is something you can’t really avoid, as untreated hot tub water can cause problems to the hot tub and to the people who use the spa. One way of reducing the cost of the chemicals you need for your inflatable hot tub is to buy a bundle of them from sites such as Amazon. If you’re concerned about being swamped with excessive bills from owning an inflatable hot tub, then you might find our article on money-saving advice useful to read: Money Saving Tips For Inflatable Hot Tub Owners (also opens in a new tab). The massage system in most inflatable hot tubs consists of a circle of holes at the bottom of the walls inside the hot tub. When you turn on the massage system, it blows air through these holes, creating a powerful all-over massage. This is why the massage system is referred to as a bubble jet massage system or an air jet bubble massage system. The strength of the massage system in inflatable hot tubs often surprises many new owners, as it really does give a good, deep muscle massage. It’s easy to think that if a massage system has more bubble jet holes in it, then it will be better than one with fewer holes. But that’s not necessarily the case. It also depends on how strong the massage motor unit is – there has to be enough power to blow the air through the holes. So always check the strength of the motor unit with the number of air jet bubble holes. One main difference between an inflatable hot tub and a more traditional rigid hot tub is that the massage system is not directional – you can’t focus it on certain areas of your body for an intense massage. The only exceptions to this, however, are the MSpa Elite Jet Reve and the MSpa Luxury Exotic 6 Person Spa. These are top-of-the-range luxury inflatable hot tubs, which both have adjustable hydro-massage jets, just like the ones you get in traditional hot tubs and jacuzzis. Every inflatable hot tub for sale in the USA runs off 110-120V, and are known as plug-and-play hot tubs. This means you plug them into a normal household socket to set them up and run them – they don’t require any specialist wiring, any special tools, or any specialist knowledge. We strongly recommend that you set your inflatable hot tub at least 12 feet away from the socket. This is to avoid the socket being splashed, which could cause a short circuit or even electrocution. Also, you must never use an extension cable with your inflatable hot tub. Most models come with a lead that is at least 20 feet long, which should be suitable for most users. If you have a site in mind and the nearest socket is more than this distance away, call in an electrician to instal a socket nearby to use with your inflatable hot tub. Resist the temptation to ever use an extension cable. It really is not worth the risk. It’s very easy to set up an inflatable hot tub. You definitely don’t need any expert knowledge or special tools. You lay out your hot tub, attach the motor unit, plug the motor unit into your household socket and inflate the hot tub. From there, you make sure the hot tub is in the exact position you want it, and then you fill it with water using a garden hose. In total, it takes about an hour from taking the hot tub out of the box until it’s filled with water and ready for you to put on the cover and turn on the water heater. The very first time you do it, however, it will probably take longer than that, as you’ll occasionally need to refer to the owner’s manual or dvd to check which part goes where. We strongly recommend that you read through the manual or watch the dvd before you attempt to set up your inflatable hot tub for the first time, as this will save you a lot of time and mistakes. The only exceptions to this plug-and-play approach are the Spa-N-A-Box and the Canadian Spa Swift Current hot tubs. That’s because these are high-end hot tubs designed for all-year use, even in the coldest of winters with sub-zero temperatures. Consequently., they have insulated foam walls which take a little more set up. From there, however, they are the same as any other portable hot tub. If you are interested in using your hot tub year-round, then we have a guide which you will find very useful: 4 Season Inflatable Hot Tubs, which opens in a new tab. When your inflatable hot tub is filled with water, it is incredibly heavy. As we saw earlier, the smallest inflatable hot tub holds 184 gallons. When you work out that a gallon of water weighs over 8lbs, then this means the weight of the water in the hot tub is more than 1,500lbs. Add on the weight of the inflatable hot tub itself, the motor unit, plus the people in the hot tub, and you’re looking at a combined weight of well over 2,000lbs! And that’s for the smallest hot tub! Some larger models have a combined weight of over 3,000lbs. What this means is that once you have filled your hot tub, you’re not going to be able to move it unless you drain it. Therefore, always leave a little space all around your hot tub so that you can get around it if you need to. The filled weight of any inflatable hot tub also means you need to think carefully if you want to site your hot tub indoors or on a deck. Check first that the floor or deck can take this kind of weight. There’s a great article we always point our readers towards over on the decksgo website which deals with the load-bearing capacity of decks (opens in a new tab). Every inflatable hot tub we review and recommend, from budget-priced tubs right through to the most expensive luxury models, comes with a range of quality features and accessories included in the price. In general terms, these include as a bare minimum a digital control panel, an insulated ground mat, an insulated hot tub cover, a chemical float, a spare filter cartridge, and a repair kit. There are other features and extras you might see that are included with some hot tubs, such as an underwater lighting display, a drinks tray, headrests, internal seats, digital locks, a floating thermal blanket, and so on. What all this means is that – apart from some key inflatable hot tub chemicals which you’ll need to purchase – your inflatable hot tub comes with everything you need to enjoy it right out of the box. Great or what? So there we have them: the 9 important facts that every beginner should know about buying an inflatable hot tub. There are others you need to think about, and you can read them through our Featured Articles Menu Tab at the top of our website. The more knowledge and understanding you have, the more informed you are to make the right choice. We hope you have learned a lot with this guide, and that you feel better prepared to buy the inflatable hot tub that is right for you, your pocket, and your needs. Thanks for reading!